How Does Coffee Ground Benefit Your Plants? Many people not only brew their own coffee at home, but also pick up a cup of coffee at their local coffee shop every single day. Have you noticed that coffee shops are often putting out bags of used coffee? Perhaps you’ve heard about using old coffee for compost. So, are coffee grounds good for plants? Should we be using our old coffee to make our gardens grow? Let’s talk about gardening and your used coffee grounds, shall we? Yes! Although it may be hard to believe, coffee grounds are packed with nutrients that your garden will love. Plants thrive in an environment with a pH level anywhere between 5.5 and 7.0, and coffee grounds come in around a neutral 6.5 to 6.8. With ground coffee, soil becomes enriched with fatty acids, nutrients and essential oils. Besides, coffee grounds prevent pests from destroying your garden, like insects and slugs that want to feed off your plants. As a result, the number of diseases decreases significantly. Caution: While most plants thrive in the nutrient rich environment that coffee grounds create in the soil, a few are adversely affected. Alfalfa, asparagus fern, Chinese mustard, geraniums, inch plants, and white clover are among the plants that may experience stunted growth and even stifled germination if exposed to coffee grounds. 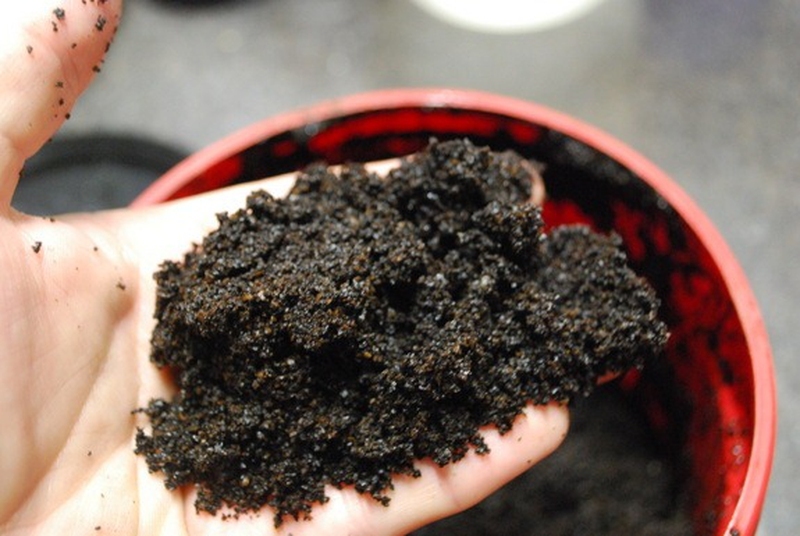 Make great use of your leftover coffee grounds by adding them to your compost. It’s as simple as pouring them in and mixing to combine the grounds with the compost. Not only will you be adding organic matter to the compost, but you will be helping the decomposition process move along more quickly. Please note that coffee grounds are considered green compost, as it is wet and rich with nutrients. Adding lots of green compost should be balanced out with more brown compost, dry ingredients like dry leaves and twigs. The nutrients that coffee grounds will offer to your garden are excellent for big, healthy plants. Coffee grounds will add magnesium, nitrogen, and potassium to your garden. Be also aware that coffee grounds do not contain lots of phosphorous and calcium. Another option for adding coffee grounds to your garden is by making a liquid to feed your plants. Instead of mixing the grounds with the compost, you can take a big handful of coffee grounds and let them age in a bucket of water for two days. Keep the bucket out of the sun, in a cooler place, and you will find an amber liquid ready. Just strain the grounds and pour over your plants the same way you would water them. Are coffee grounds good for plants? Yes because they prevent unwanted weeds from growing in you garden. Certain weed seedlings can be inhibited by the chemicals in coffee grounds. However, since coffee grounds will help most plants thrive, it is good to be careful that the weeds in your garden don’t also thrive off the nutrients in coffee grounds. It’s known that caffeine kills slugs, and slugs will stay away from a garden that is highly caffeinated. Leftover coffee grounds are low in caffeine, but spraying strong coffee on your plants and compost in addition to the coffee grounds in the soil will certainly help keep those gross critters out of there. Did you know that ants hate the smell of coffee? If you put coffee grounds in your garden, ants will not come near it. Additionally, caffeine is a natural insecticide and will kill crawling bugs before they have a chance to eat up your plants. The natural fungus that grows on coffee grounds can prevent other species of fungi from growing. Fusarium, scelerotinia, and pythium are among the garden killing molds that coffee grounds will help ward off. Cats don’t like the smell of coffee either, so a garden with coffee grounds is a garden without cat urine. Worms love coffee grounds. If vermicomposting is your style, your worms will gobble up the ground coffee in a worm bin and keep your garden healthy. You can change the color of your hydrangea from pink to blue with coffee grounds, since the pH of coffee grounds brings out the blues of these flowers. You should take care about what kind of coffee grounds you use. Are coffee grounds good for plants? Yes. Are old, rotted, fermented coffee grounds good for plants? Not so much, no. Make sure the coffee grounds you use are fresh and organic. Also, coffee grounds from a drip machine have more nutrients than boiled coffee. It’s not difficult to get some coffee grounds, since most people have a coffee machine at home and in the office. Invest in organic coffee so your garden can truly reap all the benefits. Many coffee shops will package and give away used coffee grounds for free. Establish a relationship with your local coffee shop, so they will always keep you in mind before tossing away their old coffee grounds.